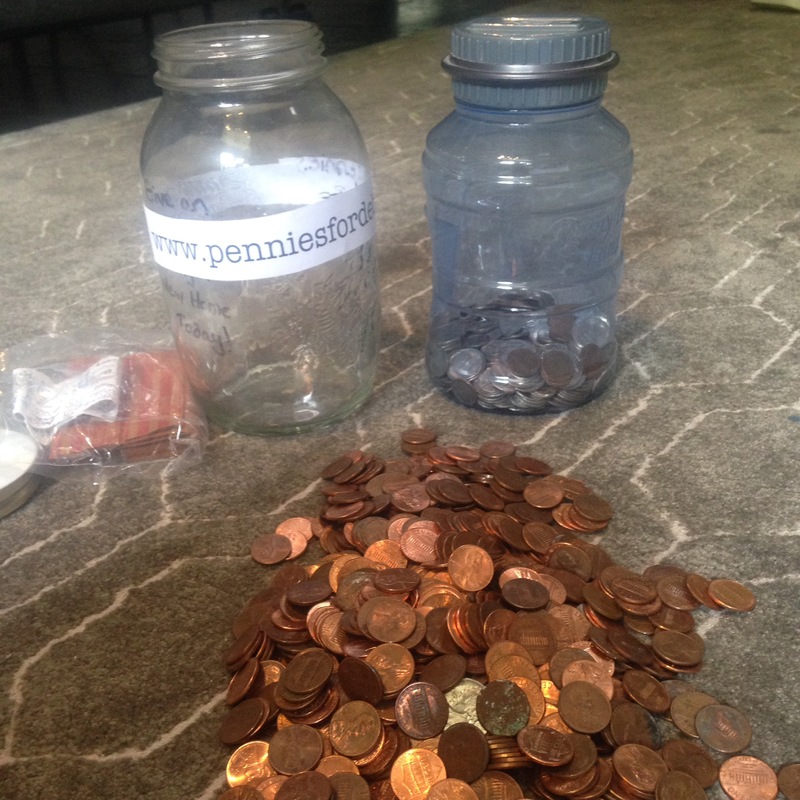 If you were wondering – Pennies for Debra is still alive. March 11, 2013 marked the fourth anniversary. And while I’ve had a few contributions this last year – mostly from my husband who would otherwise walk right past a penny on the ground – it might be on life support if one looks at the slow progress compared to the first few years. I suppose when I was working at Pursuant where the idea was born, the fund was in plain sight and everyone got a laugh out of it. The jar now sits at home – and I must admit, my advertizing has been on the back burner. We’ll have to wait and see what this next year brings. I mentioned in my November “By the Numbers” post that it has been slow (work wise) for my husband. It’s also been a bit slow on the “Pennies for Debra” front. We’ve collected a few more items to craigslist or put on ebay, so hopefully we’ll have some extra income from selling those items soon. Also, for my office Halloween luncheon, my department went as the social network, with all of us being different social media sites. I was Blogger, as in blogspot, where I blogged from 2005 – 2009. I had a Blogger shirt, very orange elements in my clothing and my prop, which was my “Pennies for Debra” jar because my “blog theme” was finances. (Not completely pretend. Ha!) Having the jar meant explaining what “Pennies for Debra” is. Which resulted in some contributions. 😀 So thanks for those that gave once purposeless pennies a new lease on life. 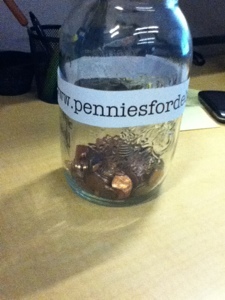 Or, for a listing of all “Pennies for Debra” posts, just go to www.penniesfordebra.com. I recently rolled $7 worth of pennies and took them to the bank and it was these 700 pennies that took the count over 10K. Here we are one month into our goal to be Debt Free by the end of 2012… how did we do? Did we make any progress? I’m happy to report, yes we did! We also made some extra money, which comes in outside of our budgeted income – so it is helpful in applying right to debt. Totaling $322 extra dollars of income. In addition to all of that – we also (of course) paid our minimums on everything else – further chipping away at principle of what we owe. Finally – I’m happy to report an additional, unexpected bonus to living on a budget. The biggest change is that we are using the envelope system for food. I specifically budgeted $100 less then what we had been averaging on food because I figured if we paid attention to where our food money went – and were a little more strict in our eating out – we would be able to make this lower food-a-month goal. I’m happy to report that including a birthday party and a birthday dinner for the hubby – we met the new food budget goal no problem! The SpamBots are starting to pick up my email address and link it with job finding. Look SpamBots – I am an Email Specialist, I know what good email looks like and I know what junk email looks like. *Reported & Deleted.